One of the nice features about Firefox is that it is customisable to the n’th degree; for example you could spend an age tinkering with the performance settings, tuning the browser to the perfect level of optimization for your system. However, many of the settings are buried away in about:config and other nooks and crannies, and are largely undocumented in the product itself. As Firefox grows in popularity and reaches beyond its “early adopter” techie user base, more and more users will want to customise and performance-tune it, but won’t be prepared to spend their time trawling the web for scraps of information. 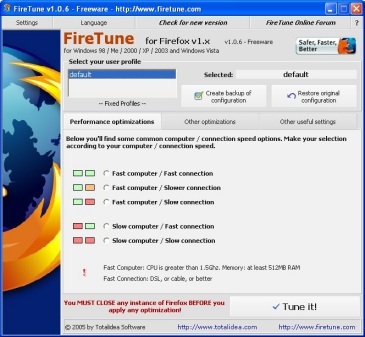 If you’re a FireFox user and you haven’t tried it yet, consider using FireTune, as it does a lot of the fine-tuning for you. The UI is nicely thought out and quite friendly for non-techies. The tuning process is very quick and painless: choose your options and click the Tune It button, and that’s basically it. Hours of trial & error saved… Highly recommended.